Vasi opens his book on the Palaces of Rome with a view of the ruins on the Palatinus and closes it with the most celebrated non religious view of "modern" Rome: the Capitol seen from the steps designed by Michelangelo. The view is taken from the green dot in the small 1748 map here below. 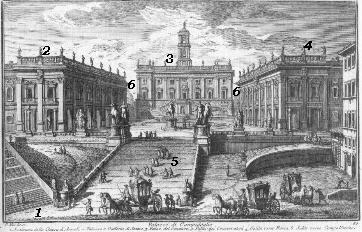 In the description below the plate Vasi made reference to: 1) Steps leading to S. Maria di Araceli; 2) Palazzo Nuovo; 3) Palazzo Senatorio; 4) Palazzo dei Conservatori; 5) Access from Rome (meaning the centre of papal Rome); 6) Accesses from Campo Vaccino. 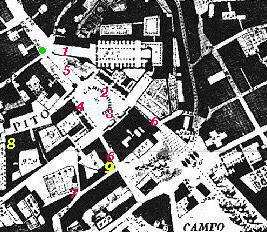 The small map shows also 7) Rupe Tarpea; 8) Palazzo Caffarelli; 9) Palazzetto Altemps. 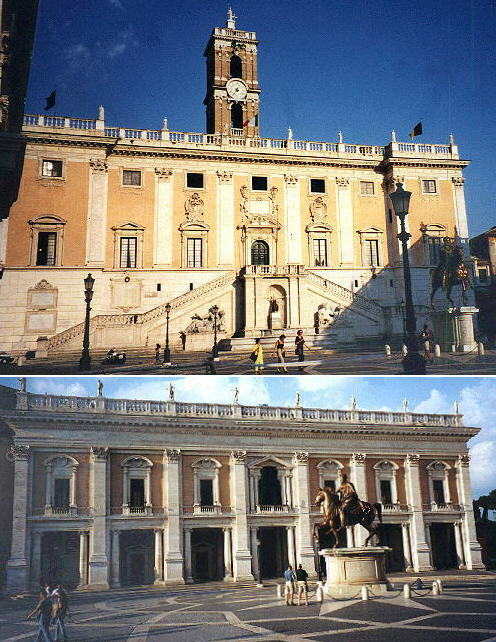 The area surrounding the Capitol has been the object of many XXth century actions to open up the center of Rome by destroying medieval buildings, but when we ascend the Capitol through these steps we get the same emotion that Charles V had when he came here to meet Pope Paulus III Farnese in 1536. The steps and the redesigning of the square are due to this meeting. In 1527 the Protestant mercenaries of Charles V besieged Pope Clemens VII (at that moment an ally of the King of France) in Castel Sant'Angelo and sacked Rome. To celebrate the reconciliation between the Papacy and Charles V and the conquest of Tunis, Paulus III arranged to meet the Emperor on the Capitol Hill so as to reaffirm his sovereign rights on the Papal State. The Capitol in ancient times was accessible only from the Forum and the Temples were facing east. 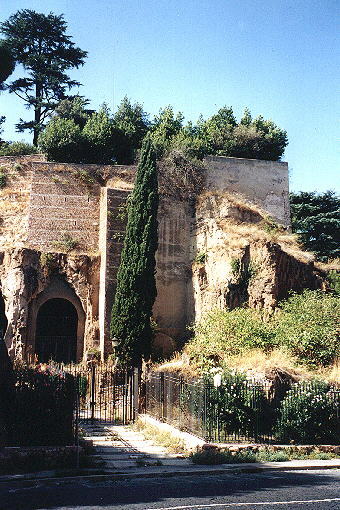 At the end of the XIVth century Bonifatius IX built the steps leading to the church of S. Maria in Aracoeli. Paulus III built a new street which from the Papal street near Piazza del Gesù and through the square of SS. Venanzio ed Ansovino reached the foot of the hill from which the new steps (easy to ascend also for horses) led to the Capitol. 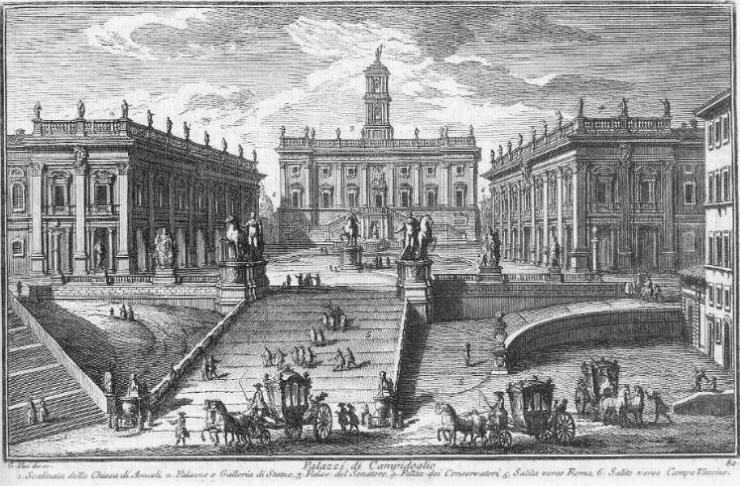 The façade of the Capitol Palace designed by Michelangelo (Palazzo Senatorio, where the Senate of modern Rome met) was completed by Giacomo della Porta at the end of the XVIth century under Clemens VIII. The side palace on the right (Palazzo dei Conservatori) was built in the XVth century and enlarged by Michelangelo, who also designed a new façade based on the so called "colossal" pillars. The side palace on the left (Palazzo Nuovo) was erected in 1646-50 under Innocentius X by Carlo Rainaldi to complete Michelangelo's project. 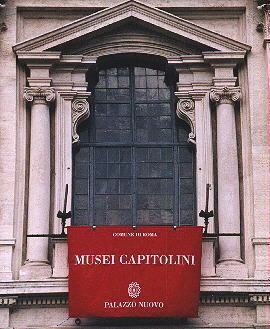 Both palaces constitute the Capitoline Museums. The colossal statue of a river-god was moved inside Palazzo Nuovo in 1679: known as Marforio it was one of the talking statues of Rome (Pasquino, Madama Lucrezia, Abate Luigi, il Facchino and il Babuino click here to learn more about Marforio and the Talking Statues of Rome). 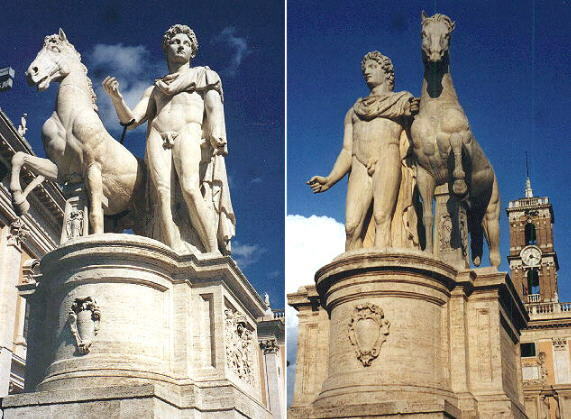 The entrance to the square is watched by statues of Castor and Pollux, which were found during the excavations for building the walls of the Ghetto and were put here in 1583. As usual they are represented as horse-tamers although only Castor had this reputation. 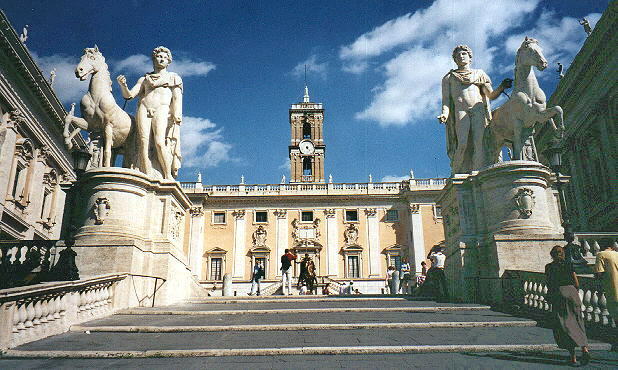 Sixtus IV donated to the City of Rome a small collection of Roman statues, which was to become the starting point of the Capitoline Museums. That explains why only Roman statues decorate the square. 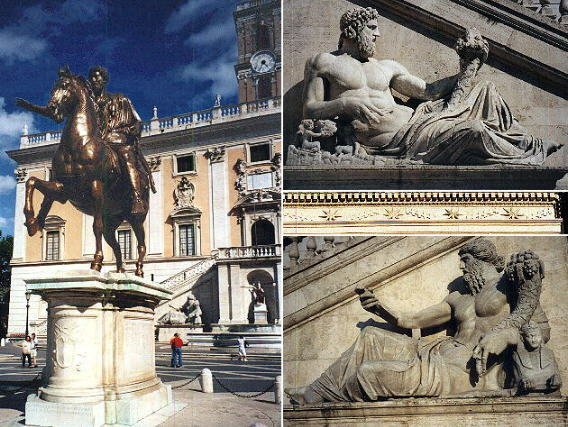 The most celebrated one is the statue of Marcus Aurelius: the statue is now in the museum and is replaced by a much criticized copy: the pedestal, carved by Michelangelo out of a large marble block of the Forum, bears in the front the coat of arms of Paulus III and in the back that of the City of Rome. 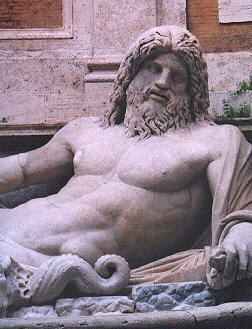 The two gigantic river god statues were found on the Quirinal and represent the Nilus and the Tigri. The Tigri however was changed into the Tiber by adding the Wolf with the Twins (see my background) . 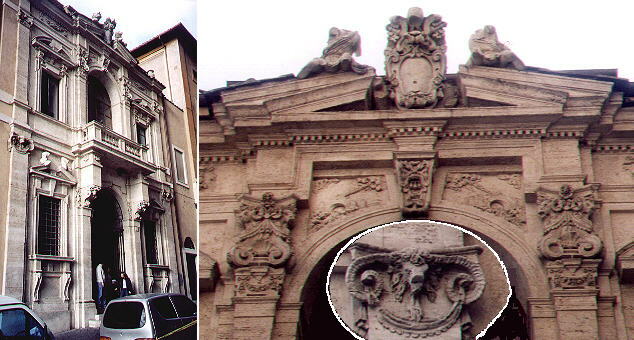 The façade of the Capitol Palace was decorated with many coats of arms of the Popes which were taken away when Rome became the Capital of the Kingdom of Italy: the decoration with the heraldic symbols of Clemens VIII (stars and stripes) was obviously spared and you can see it between the two river god statues. The tower was built in 1582 under Gregorius XIII and it has on the top a statue of Rome. The clock is not shown in the plate: it was moved here when the façade of S. Maria in Aracoeli was brought back to its medieval appearance. 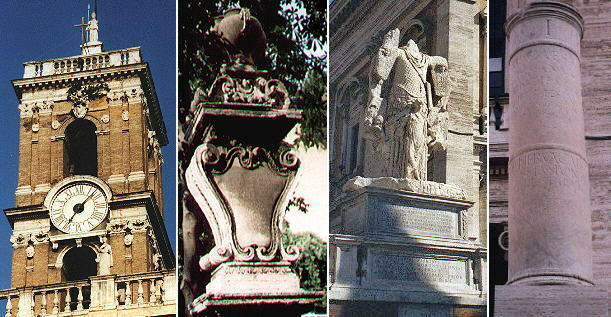 The plate by Vasi shows at the bottom of the steps the XVIIIth century "talking" coat of arms of Innocentius XII Pignatelli (pignatta=pot) with the three pots on the top (this little monument is now relocated on the carriage-way which allows cars to get to the Capitol). Sixtus V put on the balustrade of the Capitol the so called Trophies of Marius found near S. Eusebio. The balustrade is adorned also by milestones coming from Via Appia. Palazzo Caffarelli was erected in the XVIth century by Ascanio Caffarelli, a former page of Charles V. Cardinal Scipione Borghese, nephew of Paulus V, was actually a Caffarelli, being the son of Marcantonio Caffarelli and Ortensia Borghese, sister of the pope. In the XIXth century Palazzo Caffarelli became the German Embassy. It was confiscated at the end of World War I and largely modified in order to provide additional room for the Capitoline Museums. The image shows the gate at the beginning of the street leading to Palazzo Caffarelli, the current entrance to the building and another gate, next to Palazzo Caffarelli. This gate belonged to a villa owned by cardinal Girolamo della Rovere outside Porta Salaria towards the end of the XVIth century. It was moved to its current location in 1926. The buildings on the right side of the street to the right of Palazzo Senatorio were modified in the 1920s to provide room for some new offices needed by the Municipality of Rome. One of these new buildings was decorated with the façade of Villa Altemps, a villa located near Porta del Popolo which had been pulled down to enlarge Via Flaminia. The façade, designed by Onorio Longhi in 1600, was decorated with references to the heraldic symbol of the Altemps, a rampant goat. The papal coat of arms at the top of the façade was most likely dedicated to Pius IV or Leo XI, the Medici popes who protected Cardinal Altemps. Tarpea is the name of a legendary young woman who opened the doors of the Capitol to the Sabins and for this was thrown from one of the peaks of the hill, called since then Rupe Tarpea (Tarpeian Rock). Traitors were condemned to this form of death. Palazzo Caffarelli sulla rupe Tarpea Accanto al divisato palazzo verso ponente, è quello della nobilissima famiglia Caffarelli, e per quanto appare siede sulla rupe Tarpeja, poichè in niuno altro luogo si vede segno di rupe, come in quello riguardante il teatro di Marcello, appunto come si dice da Livio, da Plutarco, e da tanti altri. Si disse Tarpeja per una vergine Sabinese, che da quella parte introdusse i nemici nella Rocca: ora si dice monte Caprino, perchè essendo disabitato ne' secoli andati vi si tenevano le capre; ben è vero però che ciò s'intende per il sito dall'altra parte verso mezzo dì, in cui sin al Pontificato d'Innocenzo VIII., che fu del 1484 vi si eseguiva la giustizia. Go to or to Book 4 or to my Home Page on Baroque Rome or to my Home Page on Rome in the footsteps of an XVIIIth century traveller.